Confession: I love “Doctor Who“, almost as much as my 7 year old daughter, who is most definitely a “Whovian”. So what does “Doctor Who” have to do with education? Well, besides traveling back in time to visit historical people and witness historical events, “Doctor Who” shows us that one size doesn’t fit all. Common Core State Standards (CCSS) are a copyrighted set of academic standard that were adopted by nearly every state in the union. The “appeal” to the states was the grant money promised by the federal government if the state agreed to implement the CCSS, join a CCSS testing consortium, tie teacher evaluations to assessment scores, and more. The CCSS, theoretically, were supposed to solve the problem of varying academic standards between the states. But the problem wasn’t varying academic standards, it was academic standards. Academic standards are a bar that is set, I don’t have a problem with that. But academic standards set the bar at the same place for each child of a certain age or grade level, and that I have a problem with. I was the shortest child in my class, every year until high school. On track day when everyone was forced to participate in every event, I could barely get over the bar on its lowest setting on the high jump… Imagine if I was forced to clear it at a higher level or fail P.E. Standards should be set per child, not per age or grade. Children are individuals and all academic expectations need to be for a child as an individual, not the collective. Sometimes the bar will be set too high, sometimes too low, and sometimes just right. This will vary per child, and can also vary per subject, and change… just like the Doctor. The Doctor shows us, that people change, their strengths and weaknesses, as well as parts of their personality can change. We don’t stay the same, and academic standards assume everyone is the same and everyone learns the same, all the time. Academic standards put children in a box, and not a Blue Box… Academic standards are not “bigger on the inside”, they are four walls that close in on the expanding mind of a child, who is an individual destined for great things. Each child has great potential that differs from their peers. This is why I love homeschooling. I can cater my children’s education to each of their strengths and weaknesses, as well as their interests. I set the standard for each of them, and reset the bar as needed. Learning should not be forced. Learning should be enjoyable. If you believe your children should not be placed in a box, along with every other child their age, consider homeschooling today. The problems with education in this country will never get better until they realize they are throwing a cure at a symptom, not the problem. Education should be like the T.A.R.D.I.S. and should be “bigger on the inside”. There should be more to education than meets the eye, there should be more to education than tests, tests, and more tests. Education should be an adventure. Education should be an experience, not an obligation. 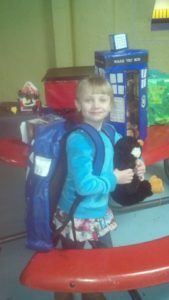 Homeschooling offers a universe of choices and opportunities. The possibilities are endless, the decision is yours… Will you put your children in box meant for the collective? Or will you choose to educate your children as individuals, allowing them to move at their pace with you as their companion? You will never be sorry that you made the choice to take the homeschooling journey with your children. Sometimes the journey is bumpy, but it is well worth it. Be sure to check out the homeschool resource page. Why Homeschool? 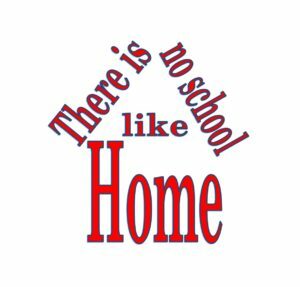 Because, There is No School Like Home.